well its is free to dl and play why not dl and play and decide for yourself? i do not even think the game is that huge. well.. i gave it a try. i thought its a different beast to be honest. reminds me of CoD games, with some interesting ideas. Just an fyi to anyone running a phenom 2 / core 2 quad or older, the game requires sse4.2 and will not run on cpus without it ,sse4.1 and 4a are not supported. In typical ea fashion they have decided to ignore the issue and not fix it. Baffles the mind that you wouldn't put mininal effort in to make your free 2 play title compatible with as much hardware as possible. Titanfall 2 runs fine on Phenom 2 so it's not like this game wouldn't be able too if they chose to allow it. The game runs ok on bulldozer based dualcores, dont think the problem is performance. If the performance will be OK, then they might change it in future... maybe even distribute second fallback executable. The game is out just for a week, give it time. I keep getting Direct X crashes with this game. ONLY this game. I've seen a few streamers face the same issue. Cannot remember the exact error code, but has anyone else ran into this problem? i didn't find a worthy FPS game on that level. Overwatch was fun for a while, but not as good as TF2. now i find the Deep Galactic game enjoyable, along with single player games as always. we used to play CoD i don't even remember which one but i gave up on it after some weeks in it. but its too fact-paced for me. at least i gave it a few hours. 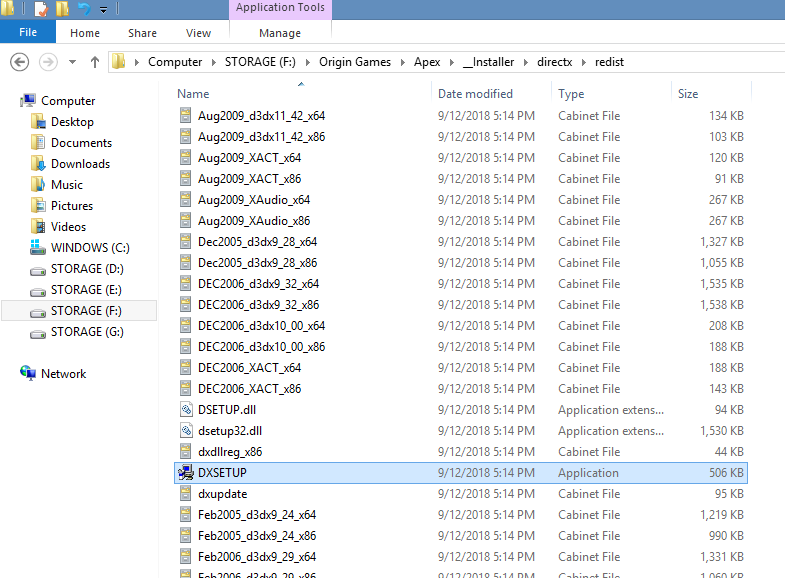 Have you tried a manual install of the DirectX package that comes within the game files? restart windows after installing. ^ Not me. I've uninstalled Apex after a day and I still hate BR. I honestly believe any BR game can only be played in a non-random, experienced party of players. Playing it with a random matchmaking results is pointless. You are only making yourselves easy kills. Also specifically to this game, weapons are way too accurate over far distances. You can headshot a dude hundreds of meters away with an automatic assault rifle, dealing damage similar to using a shotgun from close distance. No matter the armor level, armor is just an extended health. It doesn't add any additional protection against weaker weapons or lower velocity bullets etc.. To me it's really just another BR game for COD fans. Having only one map doesn't help it either. It will get repetitive and boring pretty quick. Yep same here, i hate the genre, i tried to like it but just couldn't. This game changed my mind, but only if you get decent team mates. At least i won already 3 games while in other BR's i have won none but one in PUBG. Here i always feel like i have a chance of winning. Dude ... I checked twitch last night and the largest shitnite streamer was just streaming random videos about cop cars instead lol. Today it was a German man who seemed more interested in smoking and chatting with his audience There was something about a 15k euro tournament but idk much about esports. Can't believe EA is doing this, even if it is a subsidiary which pulled it off without the dickheads at the top. Is it really that good? I don't like BR because everytime I check stuff out it is people just running around and doing nothing. Not a huge fan of single lives or slowdowns in action. Will they be adding classic modes like TDM? I had it on ps4 but deleted it. Man enters thread about a BR game to tell us all how much he dislike the BR genre. Join us next time as a guy who hates fighting games pops by the Mortal Kombat thread to let us know he is not a fan. How crazy would it be if that was literally the marketing plan, get Shroud to play the game.